Welcome to my 3rd Vegan Anniversary Week! I will celebrate by finding and re-posting previous articles and by offering multiple giveaways. The details to enter my second giveaway, featuring CSN stores, are here. 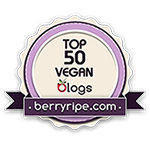 I will name the winners on Sunday evening (January 30th) at 10 p.m.
*Note: I thought it only fitting to include my one-year vegan anniversary post among the selection. I have now celebrated my one-year anniversary of being vegan. Along the way, I've had ups and downs - I started periodically eating fish for a while last fall, mostly because I felt that I was at a stand-still for food choices. Soon after, I developed horrible stomach pains and resumed my fully vegan diet once again. I feel much better now, having done that. I also want to reassure everyone who struggles with this diet that it's ok to falter once in a while, because how else can you know what's best for your body if you restrict yourself all the time? I love the vegan diet and am so glad that I abide by it, but I can see how it wouldn't be for everyone. You may be asking why I'm so lax about this, but because I became a vegan not for ethical reasons but for my health, I have a different opinion about this way of life. The health benefits are fantastic; I've written before that I have luckily not become or at least stayed sick past a few hours in the last year, and that my skin cleared up and my nails are stronger and grow longer. Those, of course, are all exterior benefits - I'd love to know what my insides are doing or "feeling" as a result of my diet. All this to say, I'm glad I took the plunge a year ago to follow this diet, and although I know I may continue to falter as time goes on, just because of my own curious nature, I ultimately believe that this is the right eating plan for me. I love that! Vegetarian and vegan diets, done, right, are SO healthy! I imagine the same is true for, like, raw food diets. So have you noticed more health effects two years later? Congratulations on completing your third year as a vegan. I'd love for you to post something about how your diet has evolved since you ended your first year.